When the temperatures dip, these DC bars, and restaurants heat up with roaring fireplaces, warm wood-fired ovens, and outdoor fire pits. So mosey on over to these prime spots for getting cozy, shake off the brr of fall and winter and warm up with an open fire and dishes and drinks sure to satisfy the appetite. This upscale restaurant set in a Federalist home exudes cozy elegance. Request a table in the John Carroll Room, which comes equipped with a roaring fireplace and an all-American ambiance that’s perfectly suited for an important date or dinner. Revel in seasonal fare like gnocchi made with Burgundy truffles and keep the cocktail menu close at hand for creations like the apple brandy-infused Autumn Sidecar. 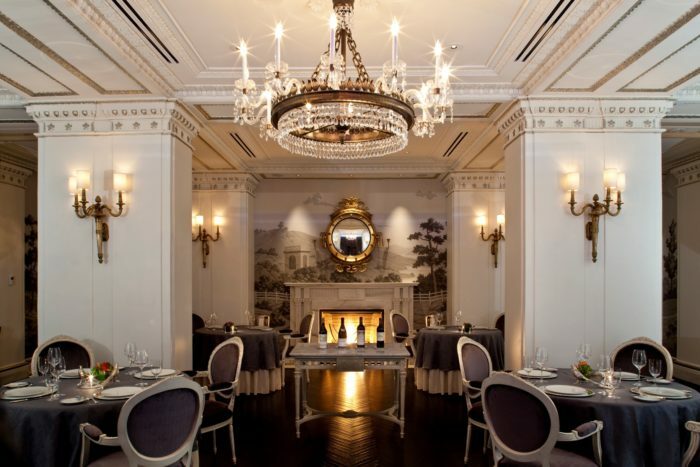 This Michelin star recipient inside The Jefferson Hotel lures diners into the main dining room with a roaring fireplace, snug nooks perfect for a romantic evening and an elegant menu inspired by the harvest from Thomas Jefferson’s Monticello with a wine list featuring more than 1,300 offerings. Plume also offers patrons private alcoves to enjoy the prix fixe menu outside of the main dining room. This stunning, recently renovated bar and restaurant in the St. Gregory Hotel features a fireplace that opens to two sides for maximum warmth and exposure. Open every day for all three meals (plus weekend brunch), you could spend the whole day in this idyllic Dupont Circle spot slurping oysters and noshing on warm pastas and flatbreads. Nestled in an unassuming location between garages and warehouses in NoMa near Union Market, chef Nicholas Stefanelli’s Michelin-starred Masseria is the definition of warm and cozy. The farmhouse-style restaurant transports diners to the Italian coast with a tasting menu inspired by the flavors of Puglia. We recommend arriving early and warming up by the patio fire pits while sipping on a signature cocktail like the Fumo di Uva, starring brandy and black walnut liqueur. Enjoy a fireside nightcap with craft cocktails and delicious apps at Quadrant Bar & Lounge in the Ritz-Carlton Washington, DC. This luxe locale also hosts live jazz music every Saturday night, a smooth complement to the swanky setting. And while you’re there, make sure to keep your eyes peeled. You never know which celebrities you’ll see checking in at the Ritz. Pull a chair around the fire, order some s’mores and tell a story on the patio of Bourbon Steak. The outdoor fireplaces, the crowd circled around the pit, and meticulously perfected cocktails mean you’ve finally found an enchanting outdoor retreat. Bourbon brings a southern twist to the classic American steakhouse cuisine while the bar offers both classic and modern cocktails in a plethora of styles. Set in the buzzworthy Capitol Riverfront neighborhood, Ana at District Winery will warm you up with housemade wines and an array of comfort dishes ideal for the season. Can you say pork shoulder confit with pickled shrimp and rice grits? (We sure can.) Pair your vino selection with fire pits and riverfront views on the restaurant’s 80-plus person patio for the coziest of evenings. A 10-foot wood-fired open hearth is the main attraction at The Dabney, chef Jeremiah Langhorne’s Michelin-starred farm-to-fork eatery in the Shaw neighborhood. The crackle of the hearth, which was custom-built by Langhorne’s father and brother, creates a soothing ambiance amidst the dimly lit dining room while diners dig into Mid-Atlantic-inspired fare from the ever-changing menu. Fireplace aficionados can bask in the warmth of the bar area’s flames at Eric Ziebold’s Kinship, one of the stars of the Shaw dining scene (not to mention a Michelin star recipient). The aptly named restaurant’s intentions are to inspire camaraderie and a connection amongst guests with a focus on family-style dishes, like whole roast chicken or rack of lamb. It’s a special place that gives diners the warm and fuzzies. Situated in the heart of Capitol Hill, the comfortable Art and Soul is ideal for a cozy group gathering. As you lounge beside a roaring fire pit, spy the U.S. Capitol dome while sipping on a gin cocktail or a beer from local purveyors. Snag your beverage of choice inside before setting up a fireside chat, as outdoor service wanes in winter.